Happy September! I wish I could tell you the leaves are beginning to fall from the tree, but it's still pretty green. Autumn will be here in another two and a half weeks or so. How are you this weekend? What are you up to? Did you have a good August? What was your favorite August read? Favorite August Read: While Love Anthony came close, I have to go with The Whiskey Sea. COYER Summer Vacation - It was such a busy summer. I did not get to all the books I had hoped, and I definitely did not link them to the Challenge blog like I was supposed to. I also was unable to attend any of the Twitter chats. Oh well. I knew going in that was a possibility. What's In a Name Reading Challenge - I haven't made much progress on this one, having only read books in three of the six categories so far. I'm still in the running for this one, so don't give up on me yet! Nonfiction Challenge - I have managed to read one book for this challenge so far, which was within my goal of reading one to five books. I still plan to try to read more before the year is out. August Comment Challenge - This wonderful challenge was hosted by Lonna of FLYLēF and Alicia of A Kernel of Nonsense, having ended August 31st. I was lucky enough to be paired with Nina from By Page or By Plane, I had such fun visiting with Nina this past month. She's insightful, and witty and has good taste in books. If you haven't, I highly recommend you check out her blog. She's worth following and getting to know! September's My Lit Box subscription arrived in the mail Friday. I was delighted by what I found inside. 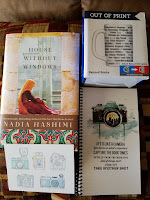 I recently read When the Moon is Low by Nadia Hashimi, one of my favorite books read so far this year. And so when I discovered A House Without Windows inside, I may have let out a squeal. There's even a signed nameplate inside! The theme this month is Home. Home comes in all shapes and sizes, and not all are safe places. For Zeba, home has become a prison cell while she awaits trial. The postcard and notebook with images of cameras are a reflection on one of the things we treasure most in our homes--photographs of our loved ones. And a mug for that warm drink to enjoy at home. The Out of Print Banned Books mug in particular is a reminder that not everyone enjoys or has access to the privileges and liberties many of us in the world do. What I Am Reading: I recently finished reading Blame It On a Cowboy by Delores Fossen, which I will be reviewing for a tour next month. I am now reading Fractured by Catherine McKenzie--from romantic suspense to a straight up thriller. I am excited about what September will bring book wise. What I Am Watching: What haven't I watched? I was laid up sick for a couple of days this past week and caught up on the fifth season of Orange is the New Black and finally was able to see the last half of Stranger Things. I enjoyed both quite a bit. My daughter and I are continuing to enjoy watching Once Upon a Time together. I tried to talk her into watching Ever After, one of my favorite movies, but she hasn't taken the bait yet. I will keep working on her. What's Going On Off the Blog: I am so glad the long weekend is finally here. Work has been extremely busy, and then I have been sick. I tried to work through it, but it got the better of me. I'm still fighting it, in fact. The summer is the worst time for the flu. Mouse started Kindergarten this past week, and seems to really like it. My husband is finding drop-offs hard though. Mouse hasn't made it a day yet without tears. She seems to be settling well into her new routine otherwise. She's made friends and seems to really like her teacher. My husband's cousin is still in the hospital after having a heart attack. His 14 year old son saved his life, performing CPR before the paramedics arrived. He is in a medical induced coma, his condition very serious. It comes hot on the heels of a death in the family, and so you can imagine it wasn't the best week. As I packed for our move six years ago, I had to let go of a lot of books. Over 500, several of which I had bought and lost interest in before I actually read them. I still ended up bringing 40 boxes of books with me. In our old house, I had books everywhere. Shelved. Stacked. Piled. Books were in every room. Our spare bedroom in particular was full of books. They covered the twin bed, every surface of the desk, inside the closet, on shelves, and covered the entire floor with the exception of a small spot I could sit down in if need be. The impending move proved a blessing in that it finally got me to go through those books more thoroughly and clear some space for my daughter as that was to be her room, even if only for a short time. When we moved, I made a vow to myself that I would step back from book buying to both save money and not let my book collection overtake my house like it had at the old house. I have also tried to be better about giving books away after I read them unless I plan to read the book again, something that I find easier said than done sometimes. I love books. And I love being surrounded by books. But there is such a thing as too much. Last year I posted photos of my bookshelves; the only difference between then and now is that there are no empty spaces. We have bookshelves in just about every room, some double shelved. I have a few stacks here and there, but not too many. What about you? Do you keep your books on shelves or do they overflow into piles and stacks around the house? Can you guess the common theme in this month's three choices? All are books I am eager to read. So much so, I hate that I have to wait a week to see which one you vote for. The covers link back to Goodreads if you want to know more about each book. The Invisible Library by Genevieve Cogman ~ The first in a series featuring a professional spy for the mysterious Library that collects fiction from different realities. Her latest assignment turns up missing before she can retrieve it. Murder at the 42nd Street Library by Con Lehane ~ The first in a series featuring a librarian, or more specifically, a curator in the crime collection, who uncovers secrets within the old library and reluctantly ends up on the trail of a murderer. Wishing Cross Station by February Grace ~ A young college library page looking into a mysterious donation travels in back in time, finding the unexpected, including possibly love. I will not be posting this week, but will be back next week. In the meantime, have a wonderful week! I'm very sorry to hear about the heart attack though. And wow, his son did an amazing job, I imagine it can't be easy to even think straight in a situation like that. Maybe this will be a better week for your family. Kristen - I am glad she is enjoying school so far. The "I don't wanna go!" days will be here soon enough unfortunately. Hopefully not for a couple years or so, at least. Thank you. We are all so proud of his son for jumping into action so quickly. He just learned CPR last year. He's still in the coma and we are praying for a good outcome. I really feel for his wife and son. This has been hardest on them. Thank you for visiting, Kristen. Happy Sunday! I think I did okay with COYER I did manage to link up when I remembered, but I didn't read and review as many as I wanted. It's hard in summer. Glad kindergarten is starting well, I think it's tough on the parents as well as the kids! That's awful about the heart attack, I hope and pray for the best. And amazing about the son, for a 14 yr old to have the poise and presence of mind to do that- just amazing. Greg - Happy Sunday to you too! I'm discovering that too. I do much better with the Winter COYER event. I guess it's good the summer one has such lax rules. Thank you for your prays and good wishes. It's still not looking good, but we're hopeful he'll pull out of this. We're all very proud of his son for taking such quick action. Not all grown-ups would be able to do that. Same here with the e-books. They take up so much less space, don't they? Thank you for voting! Have a great week, Greg and thank you for commenting. I'm glad Mouse is enjoying kindy. That's great news! It's spring here in Australia and the blooms are out. It's getting warm already so I suspect spring will zoom by! Deborah - I am too. I knew she would. :-) We just need to get her used to those morning drop-offs. It sounds beautiful where you are right now. I am glad Spring is in the air there. I hope it doesn't get too hot too soon though! Thank you for visiting, Deborah! Anna - Thank you. It came as a such a surprise. He's so young still, just a few years older than my husband. Yes, I am glad my daughter is enjoying kindergarten. :-) She's such a social butterfly (the opposite of me). I am hoping she's staying in her seat and listening to the teacher more than not. Haha. I hope you have a good week too! Thanks for visiting. Thank you for the good well wishes. This flu bug just doesn't want to let go. I slept so poorly last night because of the cough and then was up early. I'm sure I'll be napping today if I'm able. We're so proud of the son for his quick thinking. He's such a great kid as it is. No new news about my husband's cousin unfortunately, but we are remaining hopeful. Thanks for visiting, Kay, and commenting! I am glad Mouse is having a good time with Kindergarten! Sorry to hear about the heart attack, though. Hope he makes a full recovery! Thank you for the well wishes. We are remaining hopeful. Kindergarten is harder on the parents than the kids, trust me I went through it twice. They get over the tears. :) Since my hubby started collecting books, he's a prolific reader and can devour a book in under a week, our books have doubled. So far we have managed to keep them on the shelves with only a couple sneaking out to the top of my desk, but between the two of us it's only a matter of time before we'll need more space. The only thing saving us for the time is that I read alot on my phone, tablet or ereader. Hope this week is better! Shandy Jo - I'm sure she will. She's always had a hard time with separation, but she does well once we're gone. I'm just glad it's not me having to see the tears right now. I haven't read any of the books, but The Invisible Library sounds interesting! I'm very sorry to hear about your husband's cousin - I hope he manages to make a recovery! Eustacia - Doesn't it? I've been eager to read The Invisible Library for some time now. Thank you for the well wishes. Hopefully we will hear good news soon. My heart goes out to his wife and son. This has been especially hard on them. I was not good about linking up for COYER either. I did great a first, but then it just sort of went down hill!! I hope mouse continues to enjoy school!! Have a great week! Samantha - I am glad I was not the only one. I seem to do better with COYER in the winter than I do in the summer. You'd think it would be the other way around given how lax the rules are . . . Oh well. I hope you have a great week too! Thanks for commenting, Samantha! Sorry to hear about your husband's cousin. Sounds like a rough week for your family. I hope your daughter has a great kindergarten experience and adjusts to school life. I love Nadia Hashimi's books too. I have an ARC of the new one but haven't read it yet. She also has a new book for middle grade being released this week called One Half From the East. Christina - Thank you. It has been rough, but we are hanging in there. I hadn't heard of Hashimi's middle grade book. I will have to look for it. Thanks for the head's up! Thanks for stopping by and commenting, Christina! How wonderful that a fourteen-year-old boy was able to step up! My thoughts are with your family during this difficult time. Love the pics of Mouse. I couldn't get involved with the first in the first in the Library series by Cogman or with the Murder at the 42nd Street Library and DNF either one. I know a lot of people love Cogman's series, though. :) My books are both stacked and shelved! They don't get shelved unless I intend to keep them after reading them, and there are stacks in several places around the house. Jenclair - Thank you. We're all so proud of him. I don't know that I would have been that clear headed, although I would hope so. I'm sorry neither The Invisible Library or Murder at the 42nd Street Library worked for you. I know the reviews have been mixed about the 42nd Street book in particular. Hopefully I will have better luck with both. I have my unread books shelved with my read books. I do try not to shelve books I have read and do not plan to keep. It doesn't always work that way though when I'm cleaning and trying to get everything organized. Sometimes I go for tidy over reason. How scary about the heart attack, especially with the son doing cpr. How is the boy doing? I imagine that's traumatic at any age, but especially for one so young. I'm impressed he was able to perform cpr! I hope he recovers well and soon! Oh and I voted for the invisible library :) I keep seeing good reviews for it everywhere! Thank you for the well wishes. The son is doing okay. The doctor joked with him after his dad was admitted, telling him not to let it go to his head that he saved his dad's life. :-) He's very worried about his dad, as is his mom. Thank you for voting and visiting! The Invisible Library does look really good! So sorry about your husband's cousin...sending good thoughts for you. Mouse looks happy/sad in the two pictures...holding the sign looks hopeful, walking away is poignant. I could relate to your story of the growing bookshelves, and how they take over the space. I did purge some last year and the year before (I think). Time flies. I still have a lot, but none sitting on the floor anymore. Laurel-Rain - Thank you so much. We are hoping the next news that comes in is good news. My little girl is growing up. Just a week of school and I'm noticing a difference. It's crazy how fast it happens. Time really does fly. I probably should go through my shelves again and see if there are any others I need to give away. I hope you have a great week, Laurel-Rain. Thanks for visiting. Mouse's drop-offs will get easier very quickly! That is so scary about your husband's cousin. Kudos to his son for knowing CPR and being able to come through with it in an emergency! Kathy - I hope so. I think my husband is going to try a different tactic on Tuesday, so we'll see. She does seem to settle in once he's gone, and that's what's most important. Yes, we are all so proud of my husband's cousin's son. He had just learned CPR last year too. It really does pay to learn how to do it. Poor Mouse! She will get used to it and I am glad she is making friends. Sorry to hear about your husbands cousin..Sending you all positive thoughts and prayer. Michelle - I think so too. She's never been good with drop-offs and so this shouldn't be a surprise. Still, it is hard. Thank you for the well wishes. I really appreciate them and I know his family does too. I hope you have a great week too, Michelle! Stephanie - Stranger Things is such a good show, isn't it? I thought Winona Ryder was so good in it. I'll be curious to see what they come up with next. I am sorry to hear about your husband's cousin. That must have been terrifying. Thank God his son was there and knew what to do. Thank you for the well wishes for my husband's cousin. His son is amazing, and I'm so glad he was there for his dad. I am sure the separation will get easier. She had been doing so well when she was dropped off for the summer program these last few weeks. I think it's the change more than anything that takes getting used to. I feel for you about the drop off tears. We've been lucky and have only had that a time or two in the last few years but it's awful. I see people who have it every day and can't imagine how challenging that is. Sorry to hear about your husband's cousin that's amazing a 14 year old was able to take charge and really help. What an extraordinary young man! Your TBR poll was so hard! I was stuck between the Invisible Library and Murder at the 42nd Street Library both look amazing and even though time travel tends not to typically be my thing Wishing Cross Station looks good too. Have a great week! Thank you for your well wishes. We're all hoping he'll wake up soon and that he'll recover fully. It will be a long road though, regardless. Thank you for voting! I am excited about all three. I look forward to seeing which will win, although I have my suspicions. :-) I hope you have a great week too. Thanks for visiting! When I was in kindergarten, there was a girl in my class who would cry every day until noon. She did this for nearly the entire year. It can sometimes be really hard on kids to separate from their parents or familiarity, especially if they haven't had to before. I hope Mouse will start to enjoy going to school so there won't be any morning tears. I know that can be really hard. I hope you kick the flu and the demands of work start to normalize a bit. Have a great week! Charlie - Poor girl. I'm glad Mouse isn't that bad off. She stops crying pretty quickly, fortunately. Mouse had been doing really well at drop offs at the summer program the last several weeks. Before that, it was spotty with her daycare/preschool. She does seem to enjoy school, fortunately--so that, at least, isn't a battle we have to deal with. Thank you for your visit and commenting! It's still mostly warm and green here too, but this weekend we got some cooler weather so i hope autumn will be here soon. I am glad to hear Mouse has mostly settled into her new routine even though drop-offs are still hard. I voted for The Invisible Library as I heard good things about that one. Lola - I hope you are right and autumn is here soon too. We were able to open our windows the last couple of days and turn the air conditioner off. Hopefully this week will work out better with the drop offs. Fingers crossed! Thank you for voting! I have a feeling The Invisible Library is in the lead. :-) Thank you for visiting, Lola. At least you had some good shows to watch while sick. Hope you're feeling better. That's such a cute idea to do with Mouse - the little board that even says what she wants to be. It'll be cool to look back over them her senior year. Hope your family member gets better. Great job to his son! Have a great week. Christy - Yes, thank goodness for Netflix. Haha. I am feeling better today, finally. Now to just get rid of this cough. I got the idea for the board from my cousin who has done it with all her children. I worried it might be too much, but, as you said, I like the idea of looking back years from now. We got good news today about my husband's cousin. He woke up and responded to simple questions. We are all so grateful! There is still a long ways to go. I hope you have a great week! Thank you for visiting, Christy. Sorry about your husband's cousin. Hope things start to get better soon. And I've heard that drop-offs get better over time. I don't have kids myself, but my mom always told me that she had a hard time with the four of us and our very, very first days in school. Apparently I, myself, threw a little tantrum with tears and snot involved (not that I remember any of that). 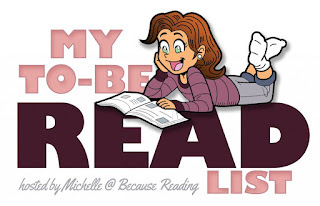 I did a random vote for your TBR List, because all of the choices sound interesting to me. Happy reading! And have a great week! Ani - Thank you so much for you kind thoughts. We received good news today, and are hopeful he will continue to show signs of improvement. My mother-in-law said my husband cried when he started kindergarten. :-) Hopefully she will do better this week. At least she enjoys being at school, even if not saying goodbye at drop-off. Thank you for voting! I look forward to reading all three, but can't wait to see which one will go first. I hope you have a great week too! Thank for you visiting, Ani! Ahh, I could really relate to those teary drop-offs. My eldest took quite a while to going kindergarten without crying; my youngest too but we were relieved she adjust to it more quickly as compared to her big sister. I'm sorry to hear about your husband's cousin and I hope that he'll get better soon. Melody - The separation can be so hard, can't it? Hopefully it will go easier this week. Thank you for the well wishes. He is doing better today. His wife sent word he's awake, which is a good sign. I hope you have a great week too, Melody! Thank you for visiting. I'm so glad that you and your little Mouse are watching "Once Upon A Time" together! That's GREAT mother-daughter bonding time! I hope you can entice her to watch "Ever After" with you, as well! So sorry to hear that you've been sick. Hope you'll be feeling much better soon! Antibiotics ALWAYS help! :) To avoid coming down with colds and/or the flu, take zinc tablets (in vitamin form, not those that are marketed for colds and flu), as well as vitamin D3. This is what I've started doing recently, as I'm really sick and tired (what a pun!) of catching these infections!! I am very sorry to hear about your husband's cousin.... How WONDERFUL that his son performed CPR on him!! That boy is a TRUE hero!! This is a very touching story....I am hoping and praying that his dad will come through this, and that IT won't happen again!!! 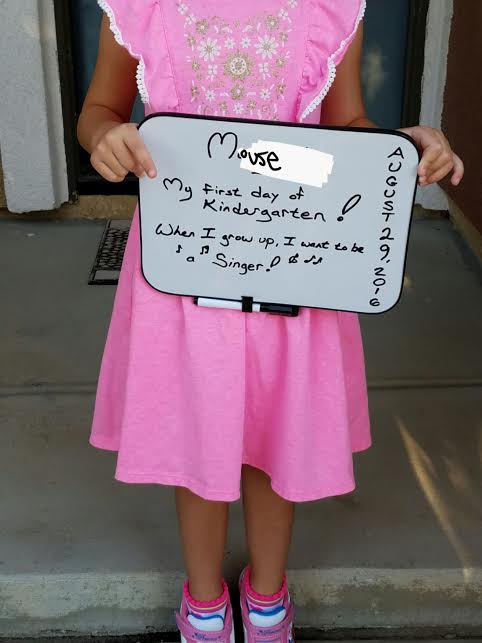 Glad to hear that Mouse is enjoying her kindergarten classes, and I can relate to her tears....the same thing happened to me when I started kindergarten. I found it very hard to be parted from my mom. As for the Book Blogger question, I think this one touches a chord in all of our bookworm hearts. We want to be "good" and stop buying books (well, some of us, like you, are doing so, and have done so), but the lure of books is SOOOO strong..... I can definitely relate to your past self, as I'm now trying to stop my compulsive book buying.... but heck, just a few hours ago (it's now 1:30 AM here in Miami) I was at B&N, as I mentioned above, and came home with a book! Sigh.... Of course, it's a VERY interesting book. But what book isn't, for us diehard bookworms? Lol. Anyway.....I applaud your determination! I am very weak-willed myself, but I MUST try.... We'll see what happens.... At least you have a big house, while hubby and I live in a one-bedroom condo....but I do have quite a few shelves, all full, nevertheless! For your TBR read, I picked "The Invisible Library". Of course, I want to read this one myself!! I featured it on my YA blog, A Night's Dream of Books, some time back. I think it was either in a "Waiting On Wednesday" post, or a "Shelf Candy Saturday" post. 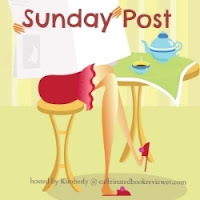 Thanks for sharing all of your bookish and non-bookish news, Wendy!! Say "hi" to your hubby for me, and tell him I'm praying for his cousin. Maria - Thank you for your thoughtful comment! A trip to Barnes and Noble sounds nice. I was hoping to stop there this weekend, but it didn't work out. I am really excited about the lit box package this month. I adore Nadia Hashimi's work. She's a beautiful writer and her books are always so emotional and eye-opening. I am finally feeling better today, thankfully. Now to just be rid of this cough. Mouse finished the last of her antibiotics yesterday and is quite happy about that. LOL She really hated having to take it. We are all so proud of my husband's cousin's son for his quick actions. As you said, he is a hero. His dad just woke up today and was able to respond to a few simple commands. It's still early yet, but this is definitely good news. Thank you for the well wishes. That's what Mouse said too-when asked why she's so sad to go to school. She says she misses her dad and me. I told her I'm always with her, right there in her heart. Hopefully this week will go better. Thank you for voting! I think The Invisible Library is in the lead if the comments are anything to go by. I hope you have a wonderful week too, Maria. Thank you for commenting! I cried once when going to school, but it was because I tripped and landed on my face. I was a bit clumsy. I hope Mouse has an easier time of it once she realizes how much fun it can be. Ever After would be a great movie for her to enjoy- I watched it a few years ago, but I recall liking it a lot. I hope your husband's cousin gets better soon, and you and your family have a great week! Mouse looks so cute in her first day photo! Alas Mouse had no interest in Ever After, but I did watch it again this weekend, and love it still. Thank you for the well wishes for my husband's cousin. There has been an improvement today, and we are all very happy to hear it. Hopefully the news will continue to be good. I hope you have a great week too! Thank you for visiting, Litha Nelle. So sorry about your husband's cousin, I hope he recovers fully. Mouse in kindergarten is amazing, she looks so tall these days. Take care Wendy. Diane - Thank you, Diane. He is doing better as of today. Still in serious condition, but he is awake and seems to be able to be responding to simple commands. Hi Wendy. I am so happy Fall is upon us. We are still having summer weather here but in the mornings and evenings it is nice and cool so the change is in the air already. You did great reading in August and your My Lit Box looks nice for September. Enjoy it! I loved Stranger Things, I can't wait for the next season. And I enjoyed OITNB too. I watch Narcos and Penny Dreadful as well, both on Netflix. Books take up so much space. I have a few stacks here and there like you say, but the main chunk of them are on my main shelves in the computer room. I hope your husband's cousin recovers, how scary. I was so pleased with this month's lit box. It's the best yet! I haven't seen Narcos or Penny Dreadful, but I do want to. I have heard good things about both shows. 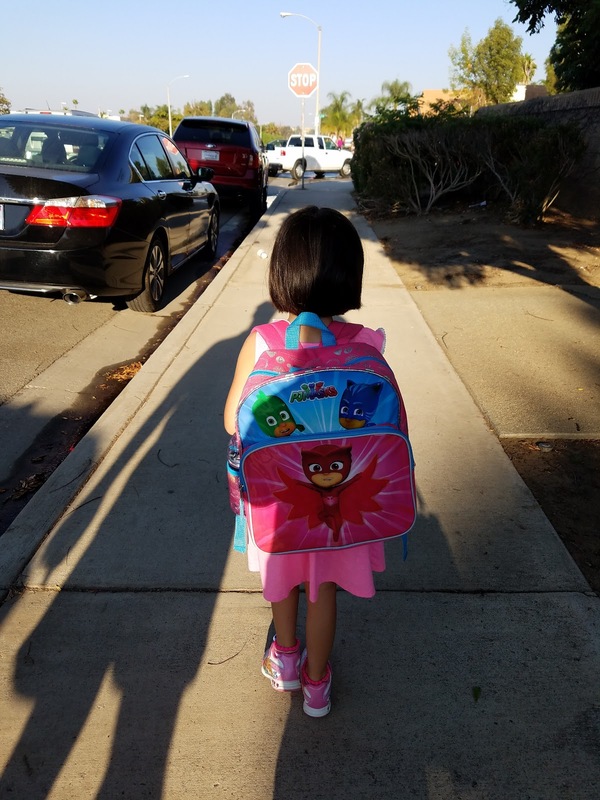 That first day of school, I had taken the day off from work and I felt so lost after dropping her off. I didn't want to do anything but run back and pick her up. My husband was in the same state. It was pretty pathetic. LOL They grow so fast. It really is scary--my husband's cousin isn't much older than my husband and I. He woke up today, and is showing signs he understands simple direction. Very promising, but the doctor's are being cautious at this point. We're hopeful. Thank you for visiting and have a great week! I really enjoyed OITNB and Stranger Things too. I love our Mouse's backpack. We are big PJ Mask fans here too. Hope your husband's cousin gets better. I voted for the Invisible Library - can't wait to see what wins! Have a great week! Grace - Both are such good shows, aren't they? I wish my husband would hurry up and catch up on Orange Is the New Black so we could discuss it. He's way behind though, so that's likely not going to happen. Thank you for the well wishes. My husband's cousin is doing better, thank goodness. It will be slow going, but we are hoping for the best. Thank you too for voting! Take care, Grace. Have a good week too! I hope you had a good weekend and found time to relax and recuperate from the flu. Doesn't it seem unreal to get sick like that in the Summer?! And, I'm sorry to hear about your family member. Sending prayers! Here's to a much better week and with good news. Thank you for your prayers. We received good news this afternoon. He's awake, although his condition is still serious. It is a step in the right direction though, and we're hopeful. Just the picture of your Lit box is delightful. What does the mug have on it? I know it would be considered out of place to some, but the idea of bookshelves in every room is wonderful. I've some stacks at the moment requiring a bookshelf, once that's set up the fewer books out of them the better. Hope you're feeling better and that Mouse finds her feet in Kindergarten. Best wishes to your family and cousin in law. Charlie - I'll be good and stick with it. :-) You can do it too! I am very happy with the lit box this month. The mug has titles of banned books all over it, some of which are blocked out until the mug is full of a hot liquid, and then the words are uncovered. I haven't had a chance to test it out yet as I'm not a tea or coffee drinker, but maybe when it's cooler and I have some hot chocolate. I don't see a problem with bookcases in every room. Like you, it sounds wonderful to me. Thank you for dropping by, Charlie! Wishing your husband's cousin a speedy recovery - how wonderful that his son was able to do this. Such good to hear Mouse is enjoying school. Those pictures are so cute. As for the question re book shelves. We have shelves (all of them tidy I have to say) of some kind of another in most rooms. Plus i have various baskets of books lying around as well. Tracy - Thank you! He is doing better, thank goodness. He spoke yesterday, which is a very good sign. We are all relieved. I love the idea of having baskets of books lying around. I have a few baskets that might be perfect for that . . . As if I need to add more books. Ahhh I loved visiting your site as well Wendy!! Your picks for the TBR List challenge look really good - it was a toss up for me between The Invisible Library and Wishing Cross Station but I ultimately went with Wishing Cross Station since I love time travel books! And I have 2 new additions to my TBR list thanks to this. I have stacks of books around the house as well, which my mother doesn't like as it makes our space look cluttered, so I do my best to keep them out of sight. I hadn't expected Blame It On a Cowboy to have such a strong suspense element, but I am glad it did. I hope you have a great September too! Mouse has done much better this week, thankfully. :-) Thanks for visiting! I have all my books in bookshelves, and I also giveaway books that I know I am not going to re-read them. But there were only a few books I giveaway. I really need too look through my bookcase and see if there are books that I will read or not so I can start clearing my bookshelves. Because I am really running out of room on my bookshelves already. lol haha :D Thank you so much for stopping by my blog hop. Before you know it Mouse won't even think twice at drop off. It is hard leaving when there are tears though. I hope your husband's cousin recovers quickly. Hearing about his teen son saving his life gave me chills. Of course, I voted for The Invisible Library! Thank you for voting and visiting! So sorry about the death and the heart attack in your family! Sending you and your family several thoughts and prayers! So glad to hear that Mouse is loving school! I can't imagine getting through that phase without a lot of tears. So it's definitely wonderful that she enjoys it. Love this month's Lit Box. I keep hoping to try it but I barely read any print nowadays so I may have to wait. Athira - Thank you. Not the best way to send off the month of August, but at least my husband's cousin is doing much better now. I read more books in e-book form too. Although I'm starting to fit more print books in. But the e-books still outweigh the print. I gave up on the What's In A Name Challenge this year because I ALWAYS fail at it! Good luck with it! Lisa - Half done isn't too bad for this time of year, which is where I am. I understand though. I think I'm going to go challenge free next year.